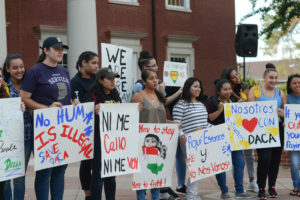 The DePauw University community responded to President Donald Trump’s decision to repeal Deferred Action for Childhood Arrivals (DACA) and stood in solidarity with undocumented students Tuesday afternoon in the Academic Quad. DACA is a two-year program former President Barack Obama enacted through presidential executive action. It allows people with undocumented status to get a drivers license, work and attend school in the United States, without the fear of deportation. Aliza Frame, a student immigration advocate, said DACA allows people to come out of the shadows and live a life without fear and instability. “The repeal of DACA will make students question if they can continue their schooling or work-study,” Frame said. For the safety of undocumented students, University officials will not disclose the amount of DePauw students under DACA. According to Myrna Hernandez, dean of students, there is a plan in place to support the students who are directly impacted. “Students who need help can work with Aliza Frame to receive a personalized plan on what to do,” Hernandez said. According to Frame, students can get these services in the Center for Diversity and Inclusion (CDI). DePauw University President Mark McCoy said he was very disappointed by the decision. “It’s now in the hands of Congress and we all need to do everything in our power to influence that decision,” President McCoy said. Kuecker believes the institution has to remain committed to doing the hard work. Hernandez said U.S. Immigration and Customs Enforcement (ICE) has jurisdiction on this campus with a legal warrant. However, ICE has yet to enter a university in Indiana. Frame said the University has to abide by the law and understand the various scenarios that may happen. In February, students protested for DePauw to claim sanctuary status to protect the students under DACA. 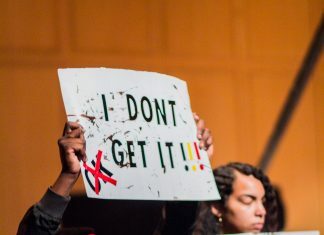 “I feel like the support struggled at the beginning because it was an unheard of situation; it wasn’t a responsibility for the school to know,” the anonymous student said. Kuecker feels it is important for the DePauw community to talk about DACA and its effect on campus. “The issue is important so that people can understand and come to terms with the reality that we are an apartheid nation,” Kuecker said. The student has a hope for Congress to follow up with something similar to DACA or something better. “It would be a life-changing experience for myself and many other students on campus,” they said. The anonymous student said they want to provide these spaces so other undocumented students know they are welcome in this community and they deserve to be on campus. Frame said there is ongoing programming for students to engage in and learn more about undocumented status.